Humans have a profound impact on their environment. The term ‘Human Ecology’ defines the study of the relationship between humans and their natural, social and built environment. This article comprises aspects of physics, chemistry and ecology, and looks at levels of particulate pollution on a relatively small scale – detailing the effects of human activity on the air itself. The data for this article was gathered from a literature review of various techniques for measuring air quality. Ideally, road dusts would have been taken for laboratory analysis but wet weather meant that topsoils had to suffice. According to the literature, particulate pollution would collect in this topsoil and could be dried and examined for magnetism and heavy metal concentration. Heavy metal particulates were chosen, as the findings of other studies showed them to be strongly associated with human activity; in this instance, motor vehicles. It was expected that particulates would settle in spots where vehicles were likely to brake or turn. Along a stretch of dual carriageway in Merseyside, two transects of roughly equal length (~1km) were established either side of the carriageway; samples of topsoil from the first 2cm of substrate were taken every 40m or so, comprising a total of 52 samples. The geographical coordinates of each site were recorded. This method was chosen to show whether changes had occurred in the magnetic properties, chemical composition and grain size of the material of the soil over a short distance, and to attempt to gauge why these changes occurred. 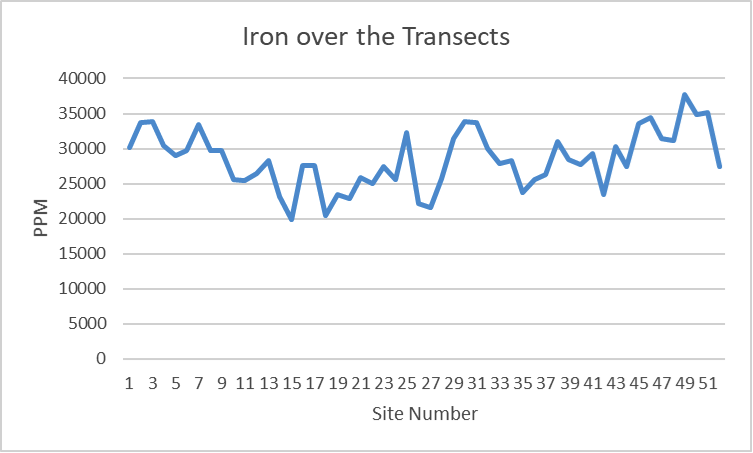 Samples 1 to 26 represent the first transect and samples 27 to 52, the second (which is in reverse order as the samples were taken after having crossed the road and doubled back). Using a Molspin fluxgate magnetometer, a Molspin anhysteric magnetiser, Molspin pulse magnetizer and susceptibility meter; ARM (anhysteretic remanent magnetisation), SIRM (saturation isothermal remanence) and magnetic susceptibility of the samples were measured. In addition, copper, iron, lead and zinc were measured in parts per million or ‘ppm’ (1:1 mg/kg) using X-Ray Fluorescence. 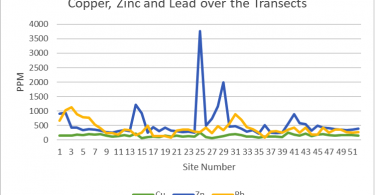 Figures 1 and 2 show the concentrations of heavy metals across the transects and Figure 3 shows an example of a map with colour-coded points showing the same (for lead only). (Click on gallery for figures). 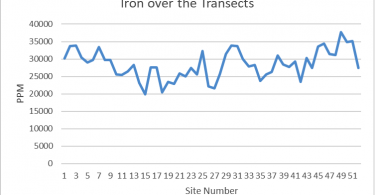 In simple terms, the heavy metal concentration data shows that, whilst varying from site to site, most of the higher values of heavy metals are located in the second transect (the latter half of the line graphs). This transect had traffic lights towards each end and a petrol filling station near the middle. Lead appears in its highest concentrations near the start of Transect 1, where vehicles turn in. Iron occurred in huge quantities relative to the other metals, and may have been of natural origin or one or more of too many possible sources to mention. 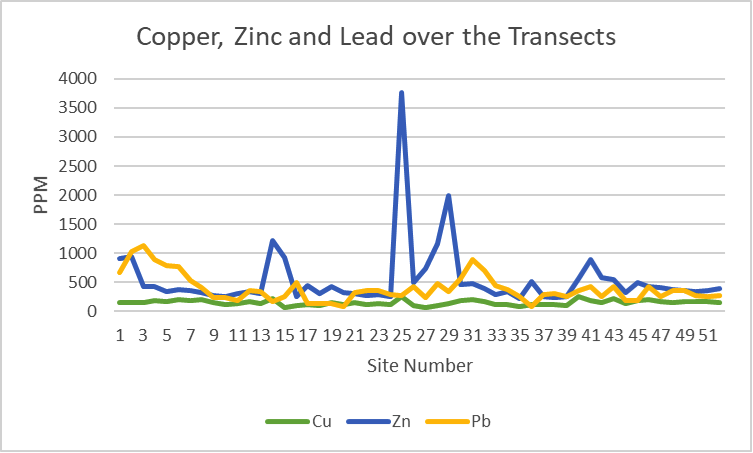 The literature review led to the conclusion that the presence of copper and zinc are likely to be the result of brake and tyre wear respectively, which explains why they are found in their highest concentrations on Transect 2, where vehicles slow down and stop regularly. Lead, however is mostly from exhaust emissions through fuel, lubricating oil and/or vehicle wear, which explains why it is found in its highest concentrations where vehicles turn. Statistical analysis of the results (employing the Pearsons Correlation Coefficient) showed that the heavy metal concentrations were statistically linked with the magnetism of the soils, as the P-Values for all but zinc vs SIRM were 0.0, forcing acceptance of the alternative hypothesis (relationship between metal and SIRM). Zinc had a P-value of 0.843 and for this element, the null hypothesis (no relationship between zinc and SIRM) had to be accepted. Both variables indicate particulate input into the soil via motor vehicles. The ARM data indicated that a smaller grain size coincides with concentrations of magnetic material, which the studies of the literature review found also. Smaller grain size in heavy metal based particulate matter is of the greatest concern to human health via inhalation. The values of heavy metals in some of the sites along the transect, far exceed what is considered safe for soil of this particular type of land use (residential without homegrown produce, as there are several homes and a primary school a matter of metres from the roadside). Because the soil, in this instance, is a proxy for air pollution, it can be assumed that the air quality is also poor, as it cannot be guaranteed exactly what percentage of particulate matter is settling in the soil or being resuspended by traffic-associated winds. It has been suggested that this wind leads to zones of maximum deposition 30-50m away from the roadside. The superficial geology of the area is blown sand (sand and gravel) and the bedrock is interbedded Triassic sandstone and conglomerate. These are a Secondary Undifferentiated and a Principal Aquifer respectively. The groundwater vulnerability of the region is classified as ‘minor aquifer high’. This means that heavy metals (and whatever other contaminants may be present in the soil) may be able to percolate through the substrate and make their way into the groundwater. It is unknown whether there are any groundwater abstraction licenses nearby but there is a canal in the local area. This may mean that aquatic species are being made vulnerable to heavy metal pollution through ingress into the canal via preferential pathways. 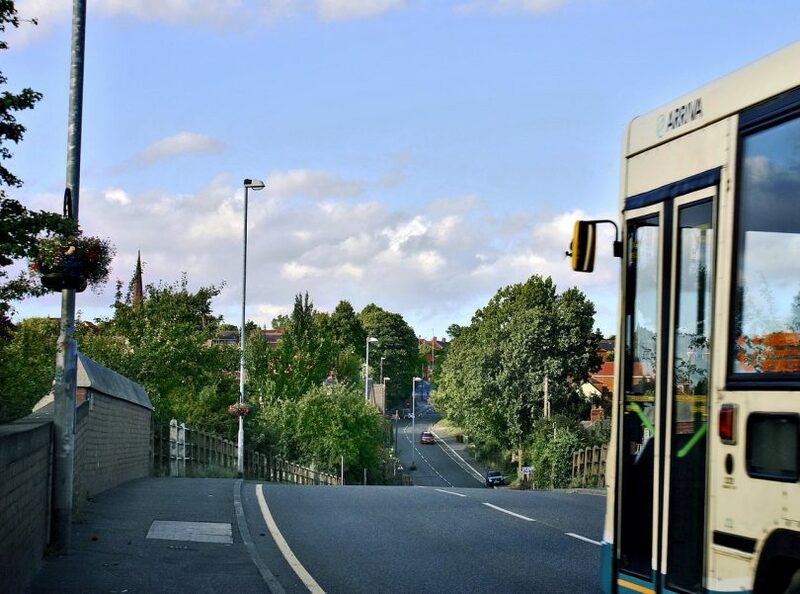 Not far from the dual carriageway, there are protected bat species (common pipistrelle, soprano pipistrelle, brown long-eared, whiskered and Brandt’s). A study by Walker et al (year unknown) showed that bioaccumulation of heavy metals occurred in insectivorous mammals, specifically Whiskered bats, whose tests showed the highest overall residues, and that there was evidence in the specimens of acute lead poisoning. This study also found that bioaccumulation meant that lead in the kidneys of the bats did not decrease when atmospheric lead declined, implying that an improvement in particulate concentrations will not be enough to repair the damage done to the species affected. Depleted numbers of these bats through heavy metal poisoning (via inhalation and bioaccumulation), may lead to increased volumes of insects in the area through decreased predation. An increase in herbivorous insects may in turn lead to damaged vegetation communities including saleable crops. 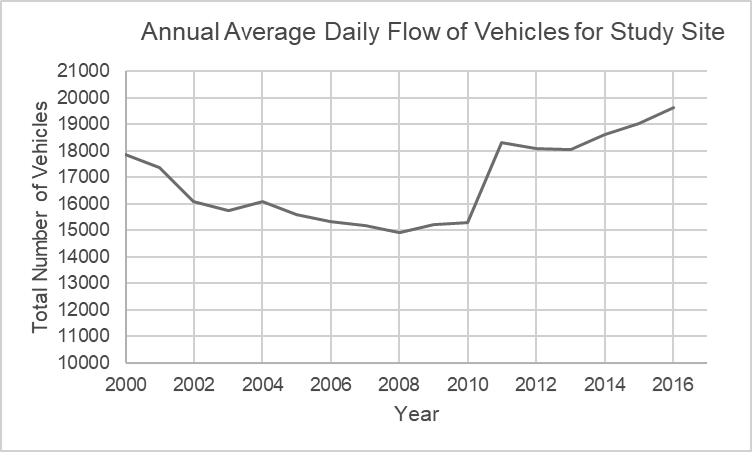 Figure 4 shows a line graph of average annual traffic flow for the dual carriageway. The graph shows an increase in number of vehicles using the road daily, which suggests a trend favouring the production of higher concentrations of heavy metals in the atmosphere, being deposited in the soil or resuspended in the air. Not mentioned here are CO2 emissions, which are undoubtedly also being produced, and have devastating effects on all sorts of communities on dry land and in the seas, such as coral reefs, which are bleaching more rapidly than ever. Recent studies from the University of Texas and World Economic Forum (both 2018) have found respectively that air pollution is both lowering global life expectancy by one year and damaging human brains. There can be no doubt that this is a major global problem. 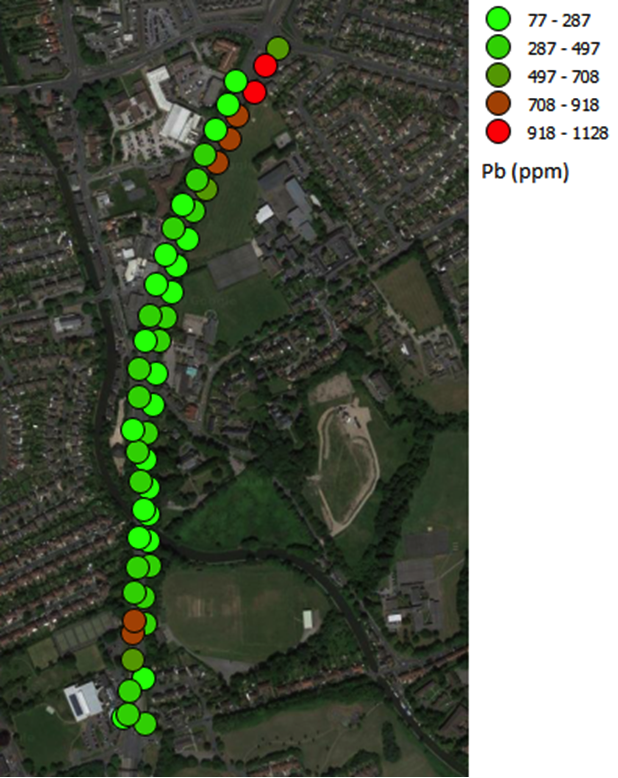 This study has looked at the levels of heavy metal pollution of one relatively small site. 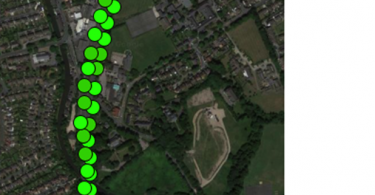 The variation of concentrations over such a small study site show that one area of land could be perfectly appropriate for its designated land use and a mere 40m away, the air and land could be dangerously polluted. It is arguably time for remediation strategies to be regularly instituted when and wherever possible. This could even be as easy as routinely sowing ameliorating species near the roadside to take up heavy metal pollutants and repair some of the damage done by human activity to our own air, land and water. Failing that, we are faced with deteriorating health and reduced life expectancy for ourselves and the creatures with which we share the earth. Settling dust has never been so unsettling. Walker, L.A., Sumpson, V.R., Rockett, L., and Wienburg, C.L., (no date) Heavy metal contamination in bats in Britain. 44 (0), pp. 1–23. 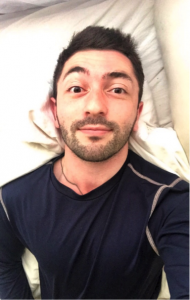 About the Author: Rohnan Milne recently graduated from Edge Hill University with a degree in Environmental Science and is currently working for EnviroSolution, an environmental consultancy company based in Liverpool.